Twenty years ago yesterday the immortal name of Anzac was first forged ’mid blood and fire on Gallipoli heights, and the event was commemorated throughout the British Empire in fitting manner. At Otaki the service will linger long in the memory of all present. It was one of the biggest gatherings for such an occasion. 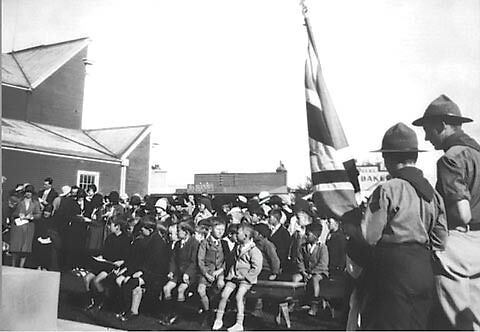 As in previous years, a procession, headed by the Otaki Brass Band, and including some fifty members of the recently-formed branch of the Returned Soldiers’ Association, Girl Guides, and children, marched from the Otaki State School to the theatre, where a large number of residents also attended. On the platform with His Worship the Mayor (Mr T O’Rourke) were the Revs. Ramson, Jackson, Nelson and P Temuera, General Young, Dr Milne, and Mr C F Atmore. The arrangements throughout were very complete and credit for this is largely due to members of the RSA… after … the “Last Post” by Bandmaster R F Fielding, the procession was re-formed and marched to the cenotaph where several beautiful wreaths, including one from the Otaki RSA and Otaki Borough Council, were deposited.